1. Heat the oil in a large pan and fry the onion for 4-5 minutes. Add the red cabbage, tomato puré, macaroni, thyme and stock. Bring to the boil, cover and simmer for 10 minutes. 2. Add the savoy and Cavolo Nero and simmer, covered for 5 minutes. Ladle into 4 bowls and serve immediately. 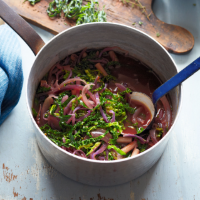 Replace a little of the stock with red wine for an extra-rich flavour.